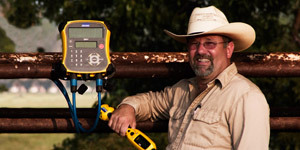 Jimmy Curtis of A-Bar Ranch talks about the benefits he has experienced introducing weighing and EID to farm operations and the importance of choosing the right brand of products. At Tru-Test, we spend a huge amount of time developing and enhancing our software. By upgrading you can take advantage of these updates. Before updating software we recommend you backup the important information stored on your device. The software update process will keep your indicator files intact. But in case of the unlikely event of an update failure you should download your data to your computer. Data Link can be used to easily check our website for software updates for both itself and for connected Tru-Test devices (All except 3000-series weigh scale indicators). Open Data Link then click on Tools>Updates...>Check for updates. Alternatively you can download the latest software (device firmware) using the links below (this will take a few more clicks). Click on the yellow arrow to the left to download the software file for your product. All of our software files are provided in “zipped” folders for easy downloading and additional safety. How do I “unzip” the software files? Click on the icon to download the zip file and select a known location to save the file on your PC. Once the download is complete, right click on the file and select the "Extract All" option, saving to the same location. After the download is complete “unzip” the file then open Data Link to update the software on your device. In Data Link click Tools>Updates>Update device firmware from a file then follow the on screen instructions to find the update file.